I can sum up this post simply by saying I’ll never make ham another way again. In the past, I’ve always baked it in the oven according to package directions, occasionally using the sugary glaze that comes with the ham and sometimes not. This time I decided to use a recipe I saw on a Year of Crockpotting. It was fantastic. Really fantastic. The ham was more flavorful than any ham I’ve ever made before and the flavors were so perfect – maple, brown sugar and pineapple. Delicious – not to mention super simple. The only change I will make next time is to significantly reduce the amount of time in the slow cooker. My ham was slightly overdone after cooking for 7 hours and next time I’ll only cook it for 4-5 hours on low. 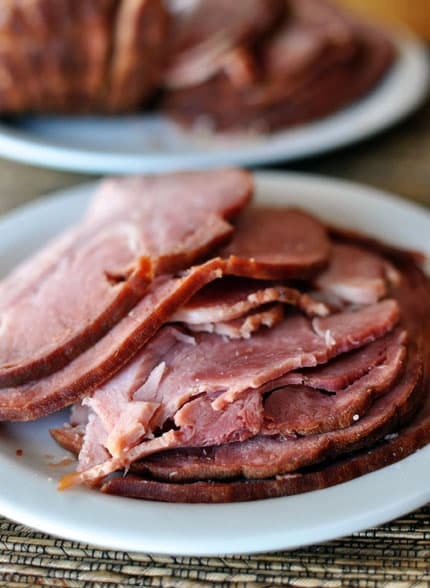 Regardless, it was phenomenal and got rave reviews from the fam – definitely my new go-to way to make me some ham. If you think your slow cooker may cook on the hot side, reduce the cooking time as needed. Use a 6-7 quart slow cooker. Unwrap the ham and discard flavor packet. 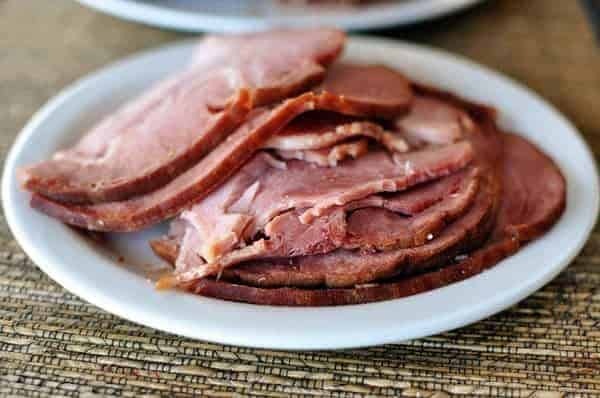 Place the ham into the slow cooker stoneware, flat-side down. Rub brown sugar on all sides. Pour on maple syrup and pineapple juice. Cover and cook on low for 4-5 hours. An hour before serving, baste ham with the collected juices from the bottom of the slow cooker. When cooking is done, remove carefully and let it rest on a cutting board for 10 minutes before carving.